The pristine cleanliness of the OCCC president’s office looks like a janitor’s dream of no dust bunnies and cobweb-free corners. For one former janitor, that office also represents an opportunity to help make others’ dreams become a reality — much as his has. OCCC President Jerry Steward said he met and conquered the hurdles of poverty to become who he is today. Steward said it was because of those struggles that he was motivated to earn an undergraduate degree from the University of Central Oklahoma and eventually, a law degree from the University of Oklahoma. He said what he persevered through not only helped shape who he is, but also it gave him the motivation to help other students. “Most of our students here were not born wealthy,” he said. “Some were, but not most. They weren’t born with a silver spoon in their mouths. They’re not trust-fund babies. Steward said he can identify with students in ways that others who have not lived through hard times cannot. “I know how it feels to come to school hungry because I did,” he said. “I know how it feels to work all night on a job and come to class the next morning with no sleep because I did that. “I know how it feels to go to class and, unlike a lot of other students, you can’t sit around and have a cup of coffee in the union … . You have to go to work. Steward said OCCC’s students are his top priority. On his way up the ladder, Steward served the state of Oklahoma as a politician from 1976 to 1980. 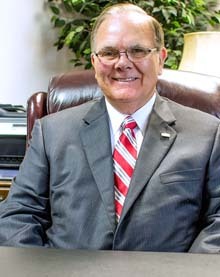 He said his time in the House of Representatives and Oklahoma Legislature helped prepare him for the role of college president. “Knowing the people, knowing the procedures, knowing the processes, knowing how to approach political issues is very, very important — particularly in today’s world where there is shrinking public support of higher education,” he said. “I think it’s a critically important skill for a college president to have, whether it’s me or anybody else. Steward said he is actively working to raise private money and procure federal grants due to the dwindling funds from the state legislature over the years. “Some people might not see the connection between that and student success, but we must have the money to keep our labs open and to keep professors in the classroom and to provide the classrooms for students to succeed,” he said. Steward said the road to success can be achieved through hard work, perseverance, keeping your eye on the prize, and not letting anything get in the way. “I believe that a large measure of my success is because I have always believed I will outwork everybody around me,” he said. “And that’s not a quick, easy, simple road to success and that’s not what you hear when you go to the seminars about success, but that’s what I believe. That’s what I’ve done. He offered some advice to students. Steward said although he had never actually considered being OCCC president, the positions he’s held at his private law practice, in the legislature, teaching and in academic roles have prepared him. He said he will use the opportunity for good. Steward said he won’t stop at helping students get a certificate or degree. He said he also plans to help them succeed in life beyond college. Steward said he hopes all students find their inner drive to succeed, no matter what obstacles may be placed in their way. “Understand the trials and difficulties you have now are temporary, but your education is permanent and nobody can take it from you. I would encourage [students] to focus on the temporary nature of the sacrifice, the permanent nature of reward.